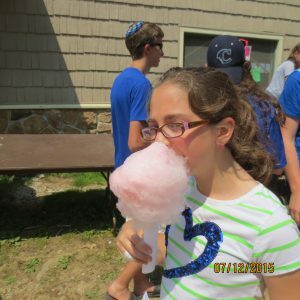 Aydat (unit) Kfirim has had a lot going on this week! Thursday was a chill day: we played some sports, swam in the agam (lake), and practiced for Zimriyah, the camp-wide singing competition, which is approaching quickly. 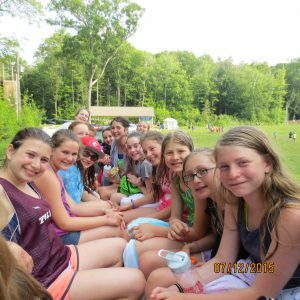 The chanichim (campers) already know all the songs and are doing great! In the evening, the banim (boys) joined the banim from aydat Leviim (rising 9th graders) for a night out at a baseball game and had a lot of fun! The banot (girls) had a special peulah (activity) in camp- Erev British (British evening)! Our amazing rosh sport (head of sports) taught the banot how to play Quidditch, the famous game from Harry Potter. Unfortunately, our flying brooms were out of order that day, but we still had a blast! On Friday, we went for a refreshing dip in our very own Lucas Pond and had some more zimriyah practice. We then had a nice Yavneh Kabalat shabbat, had great food at aruchat erev (dinner), and enjoyed a beautiful, quiet Shabbat. Sunday was one of the most special days we have had during the kayitz (summer), Yom Israel (Israel day)! Aydot Kfirim and Gurim had an amazing time learning more about Israel and having fun! At noon, we went to a real-live shuk (market)! We got to experience what it’s like to be in Israeli and bargain for souvenirs. We rotated through 6 tachanot (stations) about Israel, including going on a hayride in the Holy Land where we visited the Carmel forests, Mount Gilboa, and the ancient city of Tzipori. We also played a memory game that taught us about important people in Israeli history and made some pita bread while learning about the Bedouin culture! 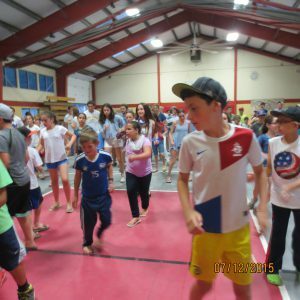 After aruchat erev (dinner), we had erev Yisrael (Israel evening), where we watched some special performances and fun videos, and summed up the day with the new things we now know about Israel! We are excited for the new week and can’t wait to tell you more about it!